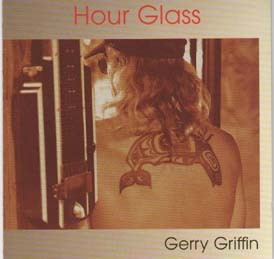 Gerry’s first CD, “Hour Glass,” was recorded “live off the floor” at Lakeside Studios in Clayton, Ontario, in July of 1995 with Gerry’s band, “Griffin”. It is a collection of songs that form the incredible diary of his wrongful incarceration in the North African and Spanish prison system in the early 1990’s. Many of the songs written during this harrowing time speak uniquely about the universal yearning for loved ones; inmates from Senegal, Morocco and Spain would sing and drum along, contributing to the final version of many of Gerry’s tunes. The album was produced by Jeffrey Lesser who has worked with Lou Reed, The Chieftains with Sting and Sinead O’Connor, The Chieftains with Los Lobos and Linda Ronstadt, and Barbra Streisand. All but one of the songs on Hour Glass were written while Griffin was incarcerated for two and a half years in the Spanish prison system in the early 1990’s. The lyrics of this song reflect Gerry’s thoughts while he was in the final days of a hunger strike. Due to his deteriorated physical condition at the time, he was hospitalized in the AIDS ward of one of the Spanish prisons and overheard doctors say that he did not have long to live. It was through writing Hour Glass that he decided to break his strike. It was the 68th day. A reflection on the values Gerry learned from his parents. This is the only song on the album that was not written in jail. Melilla is a town on the coast of Morocco controlled by the Spanish and the location of the 14th century prison where Gerry was incarcerated. Many people there had been unjustly put in jail, often for being poor or not having the correct identification papers. In this song, Gerry calls the guards “racists” and “facists”; while he was in prison, he would sing it out; the other inmates would sing and play along on buckets, or whatever they had while the guards stood by. This song is dedicated to Gerry’s friend and fellow inmate, Kitami, who, even though he stayed clean the entire 11 months he was in prison, died of a heroin overdose 2 weeks after his release. Heroin use was rampant throughout the Spanish prison system. “Chasing the dragon” is a slang term for smoking heroin from pieces of tin foil. Click here for the lyrics and song descriptions.